Tichina Rolanda Arnold, simply known as Tichina Arnold, is an American singer, as well as an actress. Tichina Arnolds is perhaps mostly recongnized as Pamela James, a character she portrayed in a famous sitcom co-created by Martin Lawrence called “Martin”. How rich is Tichina Arnold? 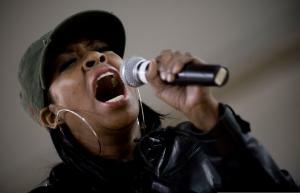 The sources state that Tichina Arnold’s net worth amounts to $12.5 million. The main sources for Tichina Arnold’s net worth, as well as wealth are her acting and singing career. Born in 1969, in Queens, New York, Tichina Arnold began her career from her earliest childhood, when encouraged by her parents she won a role in a play called “The Me Nobody Knows”. Ever since then, Arnold has been participating and performing in various theatre plays and musicals, including “Hard Times” and “Hair”. Arnold’s earliest movie roles involve minor appearances in “House of Dies Drear” and “The Brass Ring”. Arnold’s career breakthrough came in 1986 when she joined a cast consisting of Rick Moranis, Ellen Greene and Vincent Gardenia in a musical comedy film “Little Shop of Horrors”. The movie that had a budget of $25 million grossed over $38 million in box office worldwide, and was Arnold’s first major introduction to the bigger audience. In the film where Arnold starred at the age of seventeen, she has met her future co-star on “Martin” Tisha Campbell. Arnold’s acting career began to steady after the “Little Shop of Horrors” as she started receiving offers to play roles in various movies. Arnold went on to star in a romantic comedy film “How I Got into College” with Lara Flynn Boyle, and a film starring Woody Allen and Bette Midler “Scenes from a Mall”. For her role in the latter movie, Tichina Arnold has been nominated for a Daytime Emmy Award. Tichina Arnold’s fame was rising at the time when she joined Martin Lawrence and Tisha Campbell in a comedy sitcom “Martin” in 1992. With an audience of over 11 million viewers during the first season, “Martin” became one of the most famous sitcoms in the early 90s. Such instant success granted the show a number of nominations for Favorite Television Show, and even wins in such categories as an Outstanding Comedy Series and Favorite TV New Comedy Series. Tichina Arnold’s role in “Martin” helped her gain a large following, as well as opened even more career opportunities. Since then, Arnold appeared in another sitcom called “One on One” where in addition to main stars, such celebrities as Chris Brown, Omarion, Method Man and Lisa Leslie have appeared as guests on the show. Tichina Arnold then appeared in Martin Lawrence’s “Big Momma’s House”, as well as “Civil Brand” and “The Boondocks”. In addition to collecting revenue from the movies, Tichina Arnold managed to increase her net worth by creating her own company that produces headgear. The company called “China Moon Rags” has been very popular among celebrities, especially Tisha Campbell, Janet Jackson, LisaRaye McCoy and Christina Aguilera who not only modeled for the company, but have been wearing the headbands as well. 1 Friends with Tisha Campbell-Martin, Janet Jackson, Vivica A. Fox, Regina King, Christina Aguilera. and LisaRaye McCoy. 2 Gave birth to her 1st child at age 34, a daughter named Alijah Kai Haggins on March 16, 2004. Child's father is her now ex-boyfriend, Carvin Haggins. 3 Was in a relationship with Carvin Haggins. They have a daughter together. 4 She has formed a band "KNOW" Pressure. She and KNOW Pressure play regularly to packed audiences through out the greater Los Angles area. 5 She is on the advisory board for the National Parent Association (PTA), the largest volunteer child advocacy association in the nation. Sprung 1997 performer: "Don't Ask My Neighbor"
Little Shop of Horrors 1986 performer: "Prologue Little Shop of Horrors", "Skid Row Downtown", "Da-Doo", "Grow For Me", "Some Fun Now", "Dentist! ", "Feed Me Git It", "Suddenly, Seymour", "Suppertime", "The Meek Shall Inherit", "Don't Feed The Plants"